==> For recent news on Security Certificates, please visit Security Certificate updates. Security certificates are a measure of the Immigration and Refugee Protection Act (IRPA) which allow for the preventive arrest and detention of non-citizens, without charge, under secret evidence. They were introduced in their present form in 2002, but have been part of the Immigration Act since 1991. Since that date, 27 people have been subject to this process, the last one in May 2003. This process means that non-citizens are subject to years of indefinite detention under threat of deportation to torture, without a fair trial. The national Abolish Security Certificates campaign has been organizing specifically in the post 911 climate around the case of 5 men, who constitute the â€œsecret trial fiveâ€. These men are Mohammed Mahjoub (country of origin Egypt, detained since June 2000); Mahmoud Jaballah (country of origin Egypt, detained since August 2001); Mohamed Harakat (country of origin Algeria, detained since December 2002); Hasan Almrei (country of origin Syria, detained since October 2001), and Adil Charkoui (country of origin Morocco). Under the new Immigration and Refugee Protection Act, there is mandatory detention under Â§ 82(2), which states that â€œ[a] foreign national who is named in a certificate described in subsection 77(1) shall be detained without the issue of a warrant.â€ Â§ 77(1) provides that the Minister of Immigration and the Solicitor General of Canada â€œsign a certificate stating that a permanent resident or foreign national is inadmissible on grounds of security, violating human or international rights, serious criminality or organized criminality.â€ The decision that leads to inadmissibility is taken by the executive and not by a judge. A Federal Court Trial judge only has the power to decide if the certificate is reasonable, and based on this decision either upholds or quashes the certificate. The decision of the designated judge has far-reaching implications for a permanent resident like the appellant, who will be deported from the territory, this decision being final and without appeal. The security certificate process undoubtedly violates principles of due process and justice and the fundamental principle of innocent until proven guilty. It violates the prohibition against indefinite detention. The standard of evidence adopted by Parliament to justify the issuance of a security certificate is too minimal, since it is enough to have reasonable grounds to believe that the acts have occurred, are occurring or may occur when this standard should have been more stringent and require that the acts be proved according to the standard of the balance of probabilities. The Security Certificate process contravenes the right to a fair trial before an independent and impartial tribunal, when, for example, the designated Federal Court judge must determine the â€œreasonablenessâ€ of the security certificate issued by the ministers and not the merits of the case. Under paragraph 78(j), the designated judge may admit, and base his decision on, any evidence that he considers useful, even if it is inadmissible at trial. Canada has signed the UN Convention against Torture and Other Cruel, Inhuman or Degrading Treatment or Punishment. Article 3 states: No State Party shall expel, return (“refouler”) or extradite a person to another State where there are substantial grounds for believing that he would be in danger of being subjected to torture. Facilitating torture is never acceptable. In this case, it is made even more shocking by the fact that not one piece of credible evidence has been made public to support the claim that these men in any way pose a threat to Canada. None have been charged with any crime. All have been denied a fair trial. The United Nations Committee against Torture, in 2000, informed Canada that it is a violation of the UN Convention against Torture to deport an individual to face a substantial risk of torture, including when there are security concerns. The Canadian government has already recognized themselves that at least three of the men will face significant risk of torture if deported. On April 24th 2006, four of the “secret trial five”, Mohammed Mahjoub (almost 6 years into detention), Mahmoud Jaballah (on his third certificate), Hassan Almrei (4.5 years into detention) and Mohamed Harkat (detained for over three years) – were transferred to Millhaven prison near Bath Ontario. In the midst of this maximum security prison now exists a $3.5 million dollar six-cell facility Kingston Immigration Holding Centre (KIHC), created especially for security certificate detainees and run by the Canadian Border Services Agency (CBSA). 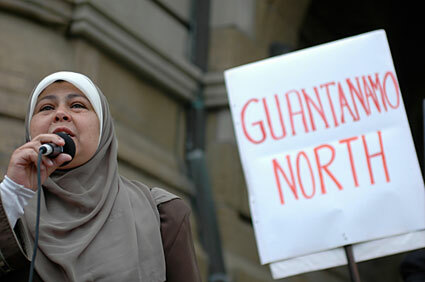 This is the prison that is now also known as “Guantanamo North” and is the latest addition to the hardships that the Canadian government has inflicted on the detainees and their families – cutting them off even further from their loved ones and legal counsel. Under the guise of the â€œwar on terrorismâ€, racial profiling and racism against Arab, Muslim and South Asian communities has increased. Racial profiling imposes a double standard on our communities by which we are held collectively responsible, and then demonized and criminalized, for the actions of individual members of our communities. History should stand as warnings to us with the red scare of the McCarthyist era and the internment of Japanese-Canadians (so-called â€œenemy aliensâ€) during WWII. Throughout Canadaâ€™s history, â€œnational securityâ€ has been used to legitimise a series of exclusionary policies that have targeted racialized â€œnon-citizensâ€, communists, socialists, anarchists and leftists more generally, as well as First Nations and black activists, lesbians, bisexuals, gay men, and other sexual minorities, along with many others. In particular, â€œnational securityâ€ concerns have had a direct impact on Canadian immigration policies and have been used as a tool of immigration control by creating a sense of fear and threat posed by â€œoutsidersâ€ to the Canadian nation and its â€œlegitimateâ€ citizens. Such policies have functioned as a discriminatory social filter that defines who gets to be Canadian and who poses a threat to those who qualify. For example in 1942, supported by the Canadian public, 22 000 Japanese people in Canada were taken from their homes over a nine month period for “National Security” reasons in the midst of World War II. By October 1942, 8 internment camps had been established in the interior of B.C.. Families were separated and all assets and belongings were seized. As men were sent to road camps in B.C., sugar beet projects in the Prairies or detained in a prisoner of war (POW) camp in Ontario. Women and children were sent to 6 inland B.C. towns. Citizens of Japan sent food shipments via the Red Cross to these towns as living conditions were so poor. Those who refused to be moved faced deportation to Japan. Similarly, security Certificates process- a form of legislated racism- is the recent manifestation in this historic trend of racism, exclusion, and the ideology of Otherness. Security certificates only apply to permanent residents and refugees. They thus deny certain classes of people in Canada their fundamental rights â€“ an unacceptable discrimination. Human rights are inalienable and do not depend on citizenship status. As the British Law Lords ruled on Dec. 16, 2004, this form of discrimination violates basic human rights. If citizens whom CSIS considers security risks are free, why should non-citizens be jailed indefinitely or deported without charges or recourse to appeal? Secret trials for refugees and immigrants are just the beginning and should stand as warnings to us. If national security is not about safeguarding fundamental freedoms and values, what is it about? Despite its existence for over 20 years, public light has rarely fallen on this legal process until a campaign against security certificates was launched in Toronto, Ottawa, and Montreal (cities where the men were originally held). Therefore, much of the effective resistance to the security certificates regimes has come from the detainees, their families, and grassroots supporters, who have tirelessly fought against the fundamentally unjust process. Over the past several years, for example, the detainees have been on near-fatal hunger strikes. The hunger strikes have often focus on basic, material considerations for the detainees, such as medical treatment in detention, and other services available in other Canadian prisons, but not in the Kingston facility, demonstrating the legal and political limbo that these men are in. On February 23 2007, the Supreme Court of Canada ruled that the security certificate process is unconstitutional, re-affirming that the right to a fair trial applies to everyone in Canada. This is a victory that is the direct result of the courage demonstrated by the detainees and their families and the grassroots mobilizing that has grown over the years. The Court gave Parliament one year to amend the provisions to bring them in line with the Charter. It is also important to note that this is not a complete victory as we struggle for Security Certificates to be abolished completely instead of replacement legislation such as that based on the UK ‘special advocate’ system which will continue to operate in secrecy and unjustly. In announcing his resignation as a Special Advocate with the Special Immigration Appeals Commission in the UK, Ian Macdonald said that he felt he was being used to â€œprovide a false legitimacy to indefinite detention without knowledge of the accusations being made and without any kind of criminal charge or trial. We demand that the Security Certificate process be completely abolished. – That they be released immediately; or, if any case against them actually exists, that they be allowed to defend themselves in open, fair and independent trials with full disclosure of the case against them. – That they not be deported.